But what’s that? You haven’t heard of the old Flash, let alone the one? This is getting confusing. It’ll probably be best to start at the beginning. 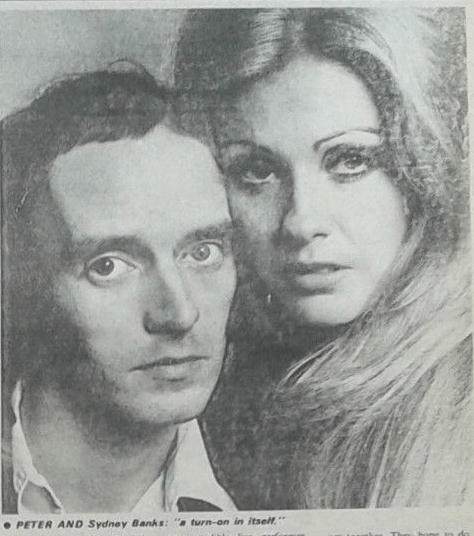 A couple of weeks ago it was revealed that Peter Banks was re-forming his band Flash with a gal called Sydney Jordan. But news like that merits no more than a few lines – you hardly hold the front page, and it’s true to say the name Flash hardly means anything to the average British music fan. Maybe the name Peter Banks means a little more. The old Flash was a four piece and was ostensibly Banks’ trip. They recorded three albums and Banks then did a solo album. The band were moderately successful in the States, but they didn’t take off in Britain at all. They broke up after their fourth tour of the States and Banks, whose solo album had been in the American charts for a while, quietly faded from sight. There’s a song that’s reminiscent of the old Flash, a blues number (near enough); a ballad; a big production thing; and a folk song (almost). But despite this obvious diversity, I thought I could still detect traces of Yes here and there. Peter sounded confused. “Yeah, I know what you mean – umm – no, I can’t necessarily agree with you. Well, to be honest I haven’t heard what Yes has been doing for the past few years. I’m surprised you say that. The new Flash is a four piece, plus Sydney who handles the vocals. Peter, of course, is on guitar and there’s Preston Ross-Heiman on drums, John Gibling on bass and Icelandic keyboard man Freeman Magnasson. I asked Peter when the new Flash album was coming out. Sydney is America – a fact I should really have mentioned earlier – she was at one time very much involved in the folk scene over there and one of the reasons she came to Britain was to get away from it. 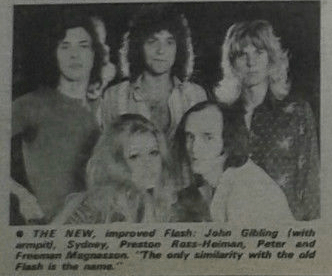 At the time Flash was on the verge of breaking up and Peter and Sydney decided to get together and write songs. Eventually, along came the new, improved Flash Mk II. In retrospect, that’s a bit of a sweeping statement, but I couldn’t but agree at the time of the interview. Perhaps, I thought, the reason why so many female performances eclipse the rest of the band is for the simple reason that – they’re female. Maybe this could happen with Flash. The new Flash are currently rehearsing and getting a stage act together. They hope to do a few British gigs in late October or early November, and plan to undertake a full scale tour in the new year – and maybe release a single or two along the way.